February 21, 2013 -- A different Steve Torrence will be driving into Firebird Raceway Friday when qualifying begins for the 29th annual NHRA Arizona Nationals. 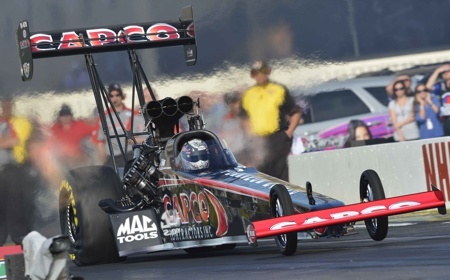 A year ago, he was embarking on his first season at the helm of the Torrence Racing/Capco Contractors Inc. one-car Top Fuel team and looking for what it takes to compete against the multi-car teams that dominate the category. He got off to a good start with his initial opening-round victory of 2012 before losing in the next round. He did, however, go on to win three races in five final rounds to place ninth in the final series standings and become the only one-car team driver to make the top 10. Contractors Inc. Top Fuel team arrive in Phoenix confident in their program and packing a wealth of knowledge gleaned from the team’s first successful foray into competitive action last weekend at Pomona, Calif.
And he is already one round-win up from this time a year ago. He began the new Mello Yello Series Sunday with a satisfying hole-shot victory over Spencer Massey before losing to eventual race runner-up Tony Schumacher in the ensuing round. His 3.789-second qualifying lap put him eighth in the quickest 16-car field in history. “We want to keep that momentum going into Phoenix,” said Torrence. “I like racing at Firebird. It would be awesome to leave Sunday night with the four more round wins and the winner’s trophy. “We had a real good race car at Pomona, and I know crew chief Richard Hogan and his guys will do the same for me at Phoenix. The first 2013 Mello Yello Series points tally finds Torrence in eighth place with 53.